عبدل‌زاده, حمیده, ابراهیمی, قنبر, لایقی, محمد, قاسمیه, مهدی, میرشکرایی, سید احمد. (1392). بررسی ویژگی‌های مکانیکی چوب پلیمر راش - فورفوریل الکل. مجله صنایع چوب و کاغذ ایران, 4(2), 131-140. حمیده عبدل‌زاده; قنبر ابراهیمی; محمد لایقی; مهدی قاسمیه; سید احمد میرشکرایی. "بررسی ویژگی‌های مکانیکی چوب پلیمر راش - فورفوریل الکل". مجله صنایع چوب و کاغذ ایران, 4, 2, 1392, 131-140. عبدل‌زاده, حمیده, ابراهیمی, قنبر, لایقی, محمد, قاسمیه, مهدی, میرشکرایی, سید احمد. (1392). 'بررسی ویژگی‌های مکانیکی چوب پلیمر راش - فورفوریل الکل', مجله صنایع چوب و کاغذ ایران, 4(2), pp. 131-140. عبدل‌زاده, حمیده, ابراهیمی, قنبر, لایقی, محمد, قاسمیه, مهدی, میرشکرایی, سید احمد. بررسی ویژگی‌های مکانیکی چوب پلیمر راش - فورفوریل الکل. مجله صنایع چوب و کاغذ ایران, 1392; 4(2): 131-140. در این تحقیق ویژگی‌های مکانیکی چوب پلیمر راش (راش- فورفوریل الکل) بررسی شده است. در این راستا، این ویژگی‌های در آزمونه‌هایی با 3 میزان متفاوت فورفوریلاسیون در سطح %‏20، %30‏‏ و% 65 و مقایسه آنها با آزمونه‌های شاهد ارزیابی شده‌اند. فورفوریلاسیون آزمونه‌ها با اشباع به روش سلول پر و پلیمریزاسیون منومر فورفوریل الکل با کاتالیزور حرارت، انجام شده است. آزمونه‌ها با پیروی از آئین نامه ASTM D-143 در آزمونهای خمش استاتیکی، کشش عمود بر الیاف، فشار عمود و موازی الیاف‏، برش موازی الیاف و سختی قرار گرفته‌اند. نتایج نشان داد که با افزایش میزان فورفوریلاسیون شاخص‌های مقاومت خمشی استاتیکی آزمونه‌ها افزایش و مقاومت کشش عمود بر الیاف کاهش پیدا می‌کنند. به‌علاوه، فشار عمود بر الیاف و برش موازی الیاف در آزمونه‌هایی با میزان فورفوریلاسیون زیاد، نسبت به آزمونه‌های شاهد افزایش نشان داده‌اند. سختی سطح شعاعی این آزمونه‌های چوب پلیمر نسبت به آزمونه‌های شاهد افزایش زیادی پیدا کرده‏اند و بر حسب میزان فورفوریلاسیون افزایش سختی سیر صعودی داشته است. Goldstein, I.S., 1955. The impregnation of wood to impart resistance to alkali and acid, Forest product journal, 5(4):265–267. Goldstein, I.S., 1960. Impregnation solutions and methods. Patent GB846680. Goldstein, I.S. and Dreher, W.A., 1960. Stable furfuryl alcohol impregnating solution, Industrial & Engineering Chemistry Research, 52(1): 57–58. Anaya, M., Alvarez, A., Novoa, J., Gonzalez, M. and Mora, M., 1984. Modification of wood with furfuryl alcohol. Revista sobre los Derivados de la Cana de Azucar, 18(1): 49–53. Westin, M., 1995. Development and evaluation of new alternativewood preservation treatments. Mid-term status report to theSwedish Council for Forestry and Agricultural Research (SJFR). (In Swedish with English summary). Westin, M., Ohlsson, B., Simonson, R. and Nilsson, T., 1996. In Proceedings of the 212th ACS. National Meeting, Orlando, FL, USA, August 25–29. Lande, S., Westin, M. and Schneider, M., 2004. Properties of furfurylatedwood, Scandinavian Journal of Forest Research 19(5):22–30. Epmeier, H., Johansson, M., Kliger, R. and Westin, M., 2007. Bending creepperformance ofmodified timber, Holz als Roh-und Werkstoff, 65:343–351. Lande, S., Riel, S., Hoibo, O.A. and Schneider, MH., 2010. Development of chemometric models based on near infrared spectroscopy and thermogravimetric analysis for predicting the treatment level of furfurylated Scots pine, Wood Science and Technology, 44:189–203. ASTM D 143-94 Standard (1994) Standard test method for small clear specimens of timber. Designation, West Conshohocken, 31p. Langwig, J.E., Meyer, J.A. and Davidson, R.W., 1968. Influence of polymer impregnation on mechanical properties of bass-wood, Forest Product Journal, 18(7):33-36. Langwig, J.E., Meyer, J.A. and Davidson, R.W., 1969. New monomers used in making wood – plastic, Forest Product Journal, 19(10):57-61. Schneider, M.H., Phillips, J.G., Tingley, D.A. and Brebner, K.I., 1990. Mechanical properties of polymer-impregnated sugar maple. Forest Product Journal, 40 (1), 37–41. Siau, J.F., Davidson, R.W., Meyer, J.A., Skaar, C., 1968. A geometrical model for wood– polymer composites. Wood Science, 1(2), 116–128. Ebrahimi G, 1998. Mechanics of wood and wood composites, 2nd ed. Tehran university publication, Tehran, Iran, 686p. Pranger, L. and Tannenbaum R., 2008. Biobased nanocomposites prepared by in situ polymerization offurfuryl alcohol with cellulose whiskers or montmorillonite clay, Macromolecules, 41 (22): 8682-8687. Gonzalez, R., Figueroa, J.M. and Gonzalez, H., 2002. Furfuryl alcohol polymerization by iodine methylene chloride, European Polymer Journal, 38:287-297. Buchelt, B., Dietrich, T. and Wagenführ, A., 2012. Macroscopic and microscopic monitoring of swelling of beech wood after impregnation with furfuryl alcohol, European Journal Wood Product, 70 (6):865-869. Brebner, K.I., Schneider, M.H. and St-Pierre, L.E., 1985. Flexural strength of polymer- impregnated eastern white pine, Forest Product Journal, 35(2):22-27. Neyestani, F. 1987. 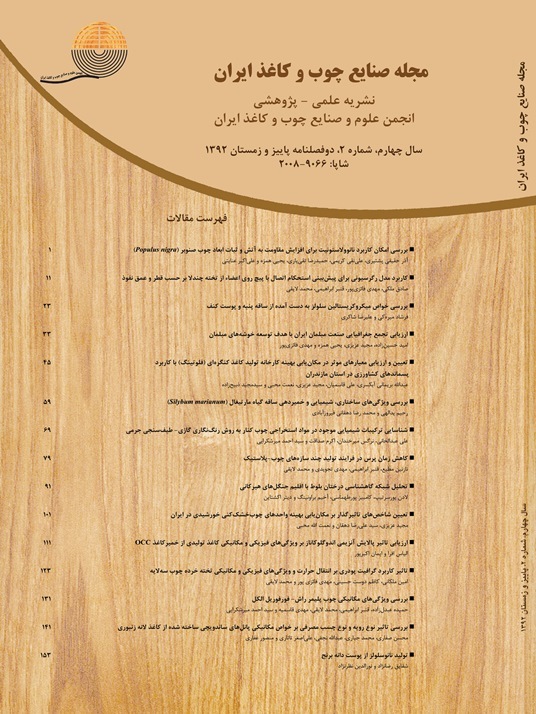 Effect of several improvement approaches on the Iranian domestic wood species for utilization in loom industry, M.Sc. Thesis, department of wood science and technology, Tehran University, 88 p.
 Ebrahimi G, 1998. Mechanical strengths of wood and its element and analysis of wood- based composites panel warping, first ed. Tehran university publication, Tehran, Iran, 380p.